During World War II, because so many men were gone to fight in the war, German and Italian internees and prisoners of war were sometimes sent to work in the forest. Their jobs included doing brush disposal, building and cleaning trails, firefighting during the summer and other such tasks. They were usually housed at former Civilian Conservation Corps camps, such as a facility at Sullivan Lake, Washington. The camps were comprised of tents or temporary wooden structures that could be easily dismantled and moved. The picture depicts a typical former CCC Camp used as a detention facility during this era. 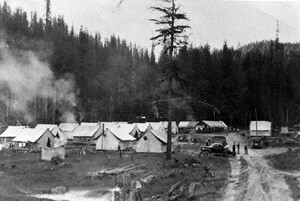 Johannes Mathäus Herrmann, a former internee, briefly described his WW II experiences in a forest camp in Idaho, possibly the one at Cougar Creek, in later reminiscences.